The greatest canine athletes on planet earth ran fast, flew high and bit hard at the 2013 Hyperflite Skyhoundz Xtreme Distance World Championship in Chattanooga, Tennessee, on September 26, 2013. Rather than prancing on carpet, like the primped and pampered pooches you might see at Westminster, these amazing canine athletes gouged out chunks of turf as they raced to snag spinning discs in midair. The 2013 Skyhoundz Xtreme Distance World Championship featured ultra-long throws made by the world's best long distance throwers and amazing last-second catches from amazing sure-mouthed canines. When the dust settled, Robert McLeod from Calgary, Alberta, Canada with canine Davy Whippet took home top honors in the Men's Classic Plastic Division. This marks the 3rd straight year they have won this title. Along with their 2012 title in the Men's Unlimited Plastic Division, Rob and Davy have 4 World Championships along with 5 World Records, including the Guinness World Record for Longest Throw with a Flying Disc to a Dog, a record for which they appear in the 2014 Guinness Book of World Records. 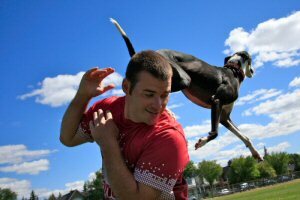 To find out more about Rob, visit http://www.frisbeerob.com and to find out about Davy Whippet, visit http://www.davywhippet.com. Always exciting, the Hyperflite Skyhoundz Xtreme Distance World Championship features top teams from around the world that qualify at competitions held in the U.S., Asia, Canada, South America, Central America and Europe. Hyperflite is committed to developing the safest, best-flying, and most durable canine discs in the world. Its support of the Skyhoundz World Canine Disc Championship series, the largest disc-dog competition series in the world, ensures that disc-dog enthusiasts world-wide will have exciting venues in which to compete. For more information about Hyperflite products or to find out about the Skyhoundz World Canine Disc Championship Series, please visit http://www.skyhoundz.com. To view the photo associated with this press release, please visit the following link: http://www.marketwire.com/library/20131004-902694800.jpg. To view the video associated with this press release, please visit the following link: http://www.youtube.com/watch?v=aCeBkn7hjbM. Davy Whippet jumps over Rob McLeod prior to one of their world record attempts. On Sunday, October 14 at around 12:46pm, Davy Whippet and Rob McLeod broke the Guinness World Record for Longest Flying Disc Throw to a Dog with a catch at 134 yards (402 feet).